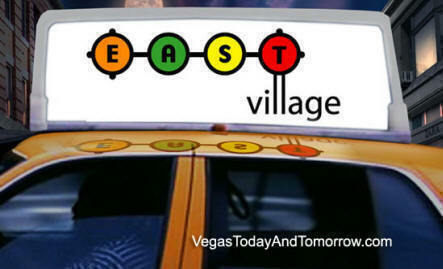 A knockoff of New York City's East Village in Las Vegas -- with its own version of the city's Meatpacking District and Washington Square is planned for 44 acres at the northwest corner of Tropicana Avenue and Paradise Road, converting the conspicuously idle acreage into a 1-million sq. ft. office-and-retail project. The 27-building, 959,645-square-foot, retail-office-entertainment complex is being developed by Mark Advent, a developer of the New York-New York hotel-casino. Advent said the developers plan to work with McCarran International Airport to have East Village designated as an alternative check-in point, where airport passengers could check bags and receive boarding passes. Resort developer Eighth Wonder is launching East Village, a $320-million project that will be the first non-gaming entertainment development in Las Vegas. It will feature themed retail, restaurant and entertainment tenants, and build the city's first free-standing, 2,000-seat theatre-in-the-round. "There have been some half-baked attempts but nothing of this magnitude that's not casino or hotel related," said Mark Advent, principal of East Village Partners and chairman of Eighth Wonder. "I've been hand-picking our tenants. I don't want it to look like a regional mall or life-style center that you'd see somewhere else". 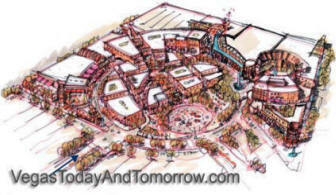 The project is originally scheduled to break ground in the first quarter of 2007 and open as soon as mid-2008. No reason was given for the delay in starting this project. Entertainment facilities including a "live" theatre and Las Vegas' first "entertainment district"